It is definitively soup weather here! I am just hoping it isn’t snowing in a few hours. Meh. Yesterday’s weather was wild with a mild, partly sunny morning, followed by alternating freezing rain and hail downpours, with high winds. It was just such a sudden switch from sunshine to hail... I heard it coming, and watched it approaching. Kinda freaky. It’s still raining, but the wind has died down and the hail stopped. (Here’s an intriguing little piece of trivia... the phrase “Hail, hail, the gang’s all here...” comes from a 1917 popular song!). I hear it used in the common vernacular, but never thought of where it came from before... until today watching the hailstorm. lol. My brain makes weird connections how about yours? 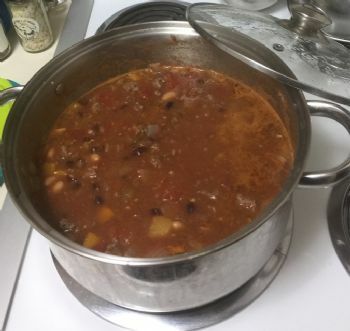 Anyways, the picture was a big pot of chili I made a few days ago. I was overwhelmed by how much I had made, so I let it be known to my family that I had extra, and it was completely gone by lunch the next day! Guess it turned out okay... this morning I made a giant pot of beef vegetable soup... at 3am, lol. Gotta do something when my insomnia has me rattling around the apartment, right? Well, the soup was just “okay”, not spectacular, or even very interesting... I posted a picture and comment on the community feed, and someone suggested adding barley. Yum! I like beef barley soup... so I added some barley, but it still wasn’t quite as ummmmm... exciting as I wished. So I added a mere pinch of cayenne and a tiny bit of an Ethiopian (?) spice called Ras el Hanout... and more beef. Now, it is much more interesting and exciting to my palate! I find flavor profiles of soup so intriguing... they change so drastically with the smallest adjustments, and again when I reheat they taste even more different... a more complex and full flavor. Yum! The building manager put up signs the other day warning that they would be testing the new fire alarm system this coming Thursday and Friday, and Cooper HATES the new alarm, which will be going off almost continuously throughout both days (I think it’s painful for him) so I am sending him off to my dad’s house during the day for both days. I will miss his furry self, but the alarm is really obnoxious! Hope you have a great day! Yummy!! Today was thinking it's time to make a big old pot of chili!!! Your soup adjustments sound delicious!!!! I'm so glad you can plan ahead for sweet Cooper! They tested our apartment block Friday. My cats don't like the sound either. When I make vegetable soup, I make sure to always add parsnip, barley, and corn. It seems the more root vegetables I add the tastier the soup. Hope you enjoy this soup, it looks very yummy! I make lots of soup in the winter too. And it never turns out the same way twice. Love to add herbs and spices to mix it up and keep experimenting until I get it right. Your storm sounded exciting too! Good soup weather! Looks yummy! Have a great day. That looks delicious. The wind was blowing something fierce here in PA last night. I like making soup too, I think that will be best for Cooper ! Yum on the soup and chili! Sounds delicious! Awww. Sorry you're gonna miss your fur baby for two days. If only we could explain to our pets the reasons we do the things we do. I love making soup too!